We should remember the statement of B.J.K. Cramer Rotterdam, the Netherlands that Jouwe in the Netherlands has taken the courageous step, following the earlier lead of the RMS movement in exile that made a similar step, by declaring that the war for secession was over and that instead any differences should be settled by peaceful means. Jouwe and Joku are smart leaders who realize their mistakes in the past. Later, they realize that Papuan should be active and become leaders in Indonesia not only in Papua. Papua is one of Indonesia provinces. Therefore, whoever Papuan leaders stay overseas are eccouraging to follow Jouwe step. We are Papuan looking forward to see you in Papua sooner or later. “NKRI is non-negotiable and final,” Asmat Tribe Leaders said. Jakarta, WPP. 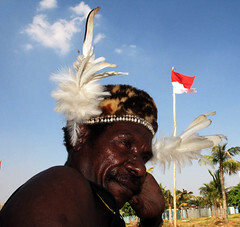 “Asmat tribe opposes separatism in West Papua and they hope that Asmat land, Papua land, Indonesian land become land of peace for all creatures, “Ketua Lembaga Musyawarah Adat Asmat or LMAA Yuvensius A Diakai, BA said in a press conference announcing a new Asmat regent vision in Jakarta on 31 January 2008. He added “Asmat tribe is a part of the Unitary State of the Republic of Indonesia (NKRI) and oppose the existing separatism in Papua,”. Moreover, Vice Chairman of LMAA Amandus Anakai stated that motto “Ja Asmanam Apcamar” (walking with full balance) elaborates Asmat regent vision is to build Asmat based on the Asmat culture pillar. He also added that NKRI is non-negotiable and final. Merauke,WPP. 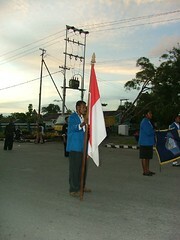 Chairman of the Papuan Regional Board of the Communication Forum of the Sons and Daughters of Retired Military (FKPPI)  Yan L. Ayomi, S.Sos at the inauguration of Managing Board (Merauke Regency) for the 2008 – 2013 period on 26 January 2008 said Pancasila, NKRI and Merah Putih are the bottom line for the Republic of Indonesia. We should develop Wawasan nusantara “national outlook”  thinking regardless of ethnicity, race and religion in order to keep unity and harmony. Meanwhile, Vice Merauke regent, Mr. Waryoto invites FKPPI to hand in hand with local government and other components to build a better Merauke. Unity should go together with the sense of loving to the country. “This is important to promote and make our country big and recognized,” he said.